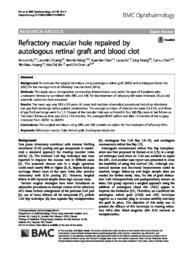 Background: To evaluate the surgical technique using autologous retinal graft (ARG) and autologous blood clot (ABC) for the management of refractory macular holes (MHs). Methods: This study was a retrospective, consecutive, interventional case series. Six eyes of 6 patients who underwent vitrectomy combined with ARG and ABC for the treatment of refractory MH were reviewed. Visual and anatomic outcomes were evaluated. Results: The mean age was 59.0 ± 9.9 years. All cases had multiple vitreoretinal procedures including vitrectomy and gas fluid exchange before patient presentation. The average numbers of vitrectomies were 2.3 ± 0.5, and those of gas fluid exchange were 3 ± 1.7. Closure of the macular hole was achieved in four (66.7%) cases at last follow-up. The mean follow-up time was 25.2 ± 15.6 months. The averaged BCVA before and after 12 months of the surgery improved from 20/591 to 20/244. Conclusions: This surgical technique using ARG and ABC provide an option for the treatment of refractory MHs.